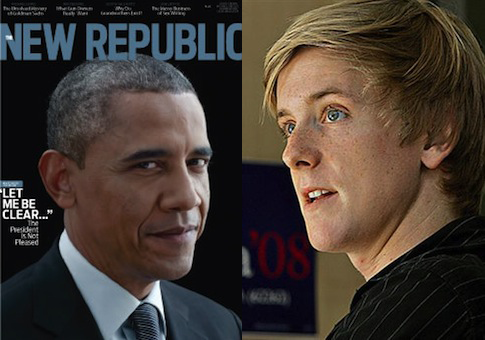 Just months after the New Republic magazine implemented an ambitious online redesign, the liberal journal's new iPad application is being panned as error-riddled according to several customers who reviewed the app and described the program as a "mess." The magazine vowed to make an aggressive foray into the online realm following its purchase by Facebook millionaire and Democratic operative Christopher Hughes, who has billed himself as a tech-savvy innovator. Hughes completely overhauled the 98-year-old magazine’s website and print edition soon after crowning himself TNR’s publisher and editor-in-chief last March. Now TNR’s iPad app—which Hughes dubbed a critical part of his plan to modernize the publication—appears to have fallen flat. "This is the worst," wrote one disappointed customer in a review that is headlined "Awful." All quotes appear as-written on the site from actual reviews from actual users. "I have spent 35 bucks on a digital subscription and can not access my account," the user wrote. "Authorization keeps failing, I had no problems with the old app, this ‘new and improved’ version has me locked out completely. When I finally made contact with someone in the New Republic, I was told my name will be sent to the developer. Ugh." Other users had similar complaints about the application, which they described as ineffective and not worth the cost. "I had a paper subscription and last week spoke with customer support to create an account on my iPad TNR app," wrote another user in a review titled "Terrible." "Worked great. Then on Saturday, the log in in the iPad app would no longer work," the dissatisfied user griped. "I contacted TNR and they said that all was correct because the iPad app requires an additional subscription. Their own customer support said otherwise and helped me activate it." "No long a subscriber to this mess," the user added. Yet another faithful reader claimed that he could no longer access previously purchased material on the new app. "After I restored all purchases (since I paid extra to read in the app before they got rid of that stupid policy) I still can't read any of the back issues that were on my ipad before, AND I've lost access to the articles I'd saved before I updated," the user wrote on the Apple iTunes website, where the app can be purchased. "I'm really wishing I hadn't updated right now," the user wrote. TNR had promised readers a "beautiful, completely redesigned iPad app [that] brings the magazine to life with its fun and modern design," according to a description of the app on Apple’s website. "Tailored for smart, curious, socially aware readers," TNR has been "reimagined for the 21st century with fresh and compelling design across print, digital, and mobile devices," the description states. TNR further claims that the new app fixes past technological issues that had plagued users. "Resolves crashing on [Apple iPhone] iOS 6.0.1 when viewing content offline," TNR claims in the "What’s New" section of its iTunes page. TNR has been engulfed in turmoil since Hughes, a former tech guru for President Barack Obama’s 2008 presidential campaign, purchased the publication. The most recent casualty of Hughes’s crusade to revamp TNR is columnist Timothy Noah, who was unceremoniously fired from the publication last week. "I just got fired from @tnr. Don't have a clue why. Anybody got a job?" Noah tweeted after a meeting with editor Franklin Foer. Noah later described Hughes as "a young man with more money than sense" and lamented the publication’s continued downward descent, according to Politico. "I like the New Yorker fine but don't see why we need two, especially if it means losing a pretty good magazine called the New Republic," Noah told Politico. "Perhaps it is this lack of vision that doomed me." Longtime TNR insiders expressed similar concerns to the Free Beacon last year, soon after Hughes purchased the magazine. "Has [Hughes] ever written an article?" one insider familiar with the publication wondered at the time. "He doesn’t know anything about journalism. He’s a pro-Obama guy. He worked for the guy. Clearly, he’s interested in reelecting the president." Media insiders believe Hughes has traded substance for flash, turning the magazine into a tired champion of the Obama administration’s liberal policies. Marty Peretz, TNR’s former owner, wrote in a Wall Street Journal op-ed earlier this year that the publication has changed for the worse. "I don’t recognize the magazine I used to own," Peretz wrote. One of new TNR’s newer hires, blogger Marc Tracy, came under fire this week for penning what observers called a poorly constructed hit piece on conservative policy guru Yuval Levin. Daily Beast writer David Frum dubbed Tracy’s piece a "pathetic attempt to attack Yuval Levin." Frum went on to call Tracy’s arguments "lazy." "The author of this lazy hit seems hardly well positioned to determine who qualifies as a ‘philosopher’ and who as a vulgar ‘operative,’" Frum wrote. "Bring back Timothy Noah! He at least could have offered readers some actual reasons to support his dislike of the [Paul] Ryan [budget] plan." Hughes recently purchased a $2 million dollar home in New York where his husband Sean Eldridge plans to run for Congress. A TNR spokesperson did not respond to a request for comment about the magazine’s fledgling iPad app. This entry was posted in National Security and tagged Chris Hughes, Media, The New Republic. Bookmark the permalink.